Composed by the Portuguese Jesuit Father Manuel de Góis (1543-1597), the small book entitled, Commentarii Collegii Conimbricensis Societatis Iesu In libros Aristotelis, qui Parva Naturalia appellantur belongs to the editorial series published in Lisbon, in 1593, by the Printer Simão Lopes (230x170mm). As regards a possible conjecture of the years in which it was composed, the reader is advised to consult the equivalent introduction to the first volume of the entire Coimbra Jesuit Aristotelian Course, viz. on Physics. Let us remind that this Lisbon series also includes: the four books On the Heavens, and the Meteorology; the Ethics too was published in Lisbon, but perhaps edited only after the commentary On Generation and Corruption. That this must be considered as a series is indicated by the fact that at the cover of the Parva Naturalia the reader is informed that the “privilege, the approvals and the necessary permissions should be found at the beginning of On the Heavens”, and also by the fact that in its short Preface (Prooemium), the Parva Naturalia refers to the Meteorology. After informing the reader that the volume is a supplement of the De Anima, Manuel de Góis explicitly writes that he follows the same method of composition, as well as the same way of explaining, as the one already used in Meteorology. Note that whereas the Meteororum is divided into treatises (Tractatus) and each one of these is subdivided into chapters, in the Parva Naturalia each book is individually taken and subdivided into chapters. The reader is told to check the volume on Meteororum for the justification underlying this methodological as well as compositional choice for brevity. Lastly, Góis gives the information that On Generation and Corruption is soon (propediem) to be published but he does not mention the volume on Ethics. The commentary on Parva Naturalia is published, in its end, with an Index of the chapters commented. Of the books traditionally comprehended under the title Parva Naturalia, Góis does not offer any commentary on Sense and Sensibilia. If the ground for this omission lies, as it is mentioned in the said Preface, in the fact that the subject matters on Sense and Sensibilia were dealt with mostly in the volume on De anima, the following eight small treatises were commented on (published exactly by this order): On Memory, On Sleep, On Dreams, On Divination in Sleep, On Respiration, On Youth and Old Age, On Life and Death, and On Length and Shortness of Life. 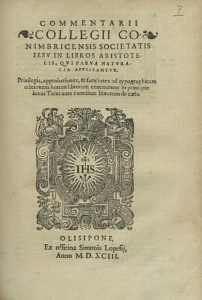 The author of this volume of the Coimbra Jesuit Aristotelian Course finishes almost all the eight titles with a small section that deals with the problems related with the respective subject matter, following the pseudo-Aristotelian Problemata Physica, a literary strategy further developed in the volumes On the Heavens and On the Soul. On the whole the volume has only 104 pages. With the exception of the volume of the Dialectics, this title reproduces in its cover the logo of the Society of Jesus, with the Latin motto, “Nomen Domini Turris Fortissima”.